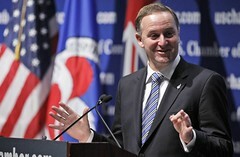 He went on to underline the importance of eventually harmonizing the taxes, saying that it would be economically detrimental for New Zealand to be in a situation when “…eventually New Zealand companies packed up and went and worked in Australia because they thought that they were going to get a better deal from climate change policy.” However, the Prime Minister also went on to say that while harmonizing the taxes was the “aim of the game” it was also only a long term goal for the two governments. However, the Prime Minister also said that before any plans can be made to synchronize the two tax systems, it will first be necessary to see if the Australian carbon tax system “survives”. He explained that the proposal to instate a carbon tax in Australia has been a heated issue for several years, and there was a chance that following the upcoming election he tax would be repealed.